The message has been ringing load and clear throughout the credit union industry for years: make better use of data and analytics or lose “member share” to more progressive CU peers or (horrors!) banks and fintech startups. Despite the warning cries, the proportion of credit unions embracing this trend is (horrifyingly!) low. A recent McKinsey & Company report emphasizes the fact that many industries are achieving only a fraction of their “digital potential”. However, the report observes, “In the United States, the information and communications technology sector, media, financial services, and professional services are surging ahead…”. This means other players in the marketplace served by credit unions have a big head start. Once “insights” are uncovered from analytics, what are the practical steps to leveraging them to create value? Most credit unions know generally what they need to do: grow members, retain members, grow products per member, etc. They also know the data needed to support strategies and tactics in achieving their goals is locked up in their operational systems. These “silos” trap data so that even simple questions about a subject area cannot be asked. Being trapped, the data cannot be linked to other valuable data so questions bridging subject areas are impossible to answer. Nevertheless, a necessary exercise must be done to inventory the trapped data by silo and make at least a rough blueprint of how the data would be used. Each silo should be analyzed for what questions could be answered simply from that source. Once all relevant silos have been analyzed, then the connections between the silos need to be identified. The resulting blueprint will serve as the starting point for how the credit union could use the data it already possesses. The McKinsey report suggests exploring improvements in generating, collecting, and organizing existing data. In terms of generating data, thought needs to be given to the source data itself. What current systems are simply past their prime? For example, there are some legacy core systems that have been on the market for 20+ years whose underlying architecture has never changed. Extracting data for analysis from their underlying databases is often a more complex (and expensive) effort than up-to-date systems. Undertake other data cleansing steps on existing data like checking for incomplete SSNs, etc. Organizing data in a better way is achieved primarily via a data warehouse. Simply described, data from multiple source systems within the credit union is extracted, transformed if necessary, and loaded into a separate database specifically built to support analytics. The new data organization also allows additional data sources to be integrated over time. The data warehouse is the ultimate data silo breaker. This is Part 1 in the Lagging Contenders blog series. 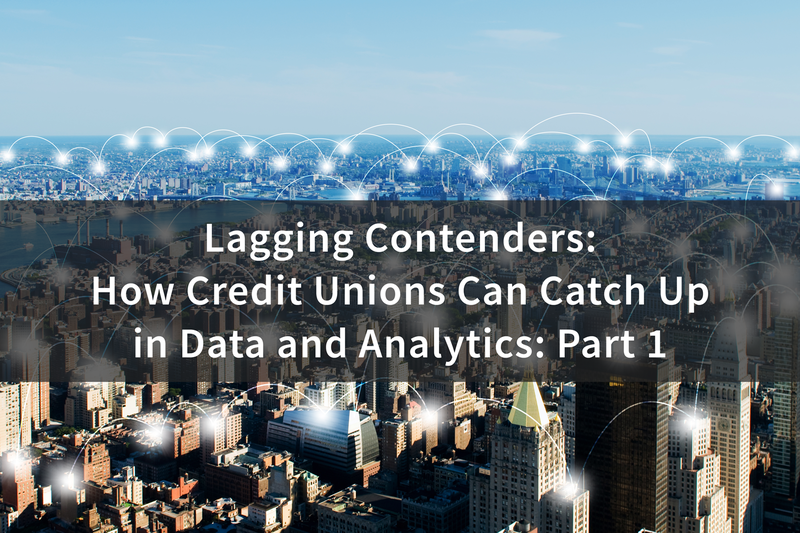 To read Part 2, visit: http://blog.onapproach.com/lagging-contenders-how-credit-unions-can-catch-up-in-data-and-analytics-part-2. Subscribe to our blog to learn more and stay up-to-date on the latest in data analytics for credit unions.